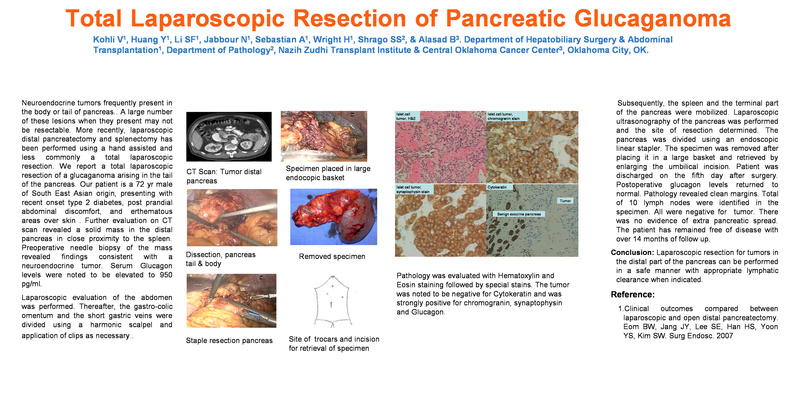 Total Laparoscopic Resection of Pancreatic Glucagonoma- case report. Tumors of the body or tail of the pancreas are uncommon. A large number of these lesions when they present may not be resectable. More recently, laparoscopic distal pancreatectomy and splenectomy has been performed using a hand assisted and less commonly a total laparoscopic resection. We report a total laparoscopic resection of a glucaganoma arising in the tail of the pancreas. Our patient is a 72 yr male of South East Asian origin, presenting with recent onset type 2 diabetes and post prandial discomfort. Further evaluation on CT scan revealed a solid mass in the pancreas in the tail close to the spleen. Serum Glucagon levels were noted to be elevated to 650pg/ml. Initial needle biopsy was obtained that revealed findings consistent with glucaganoma. Laparoscopic evaluation of the abdomen was performed. Thereafter, the gastro-colic omentum and the short gastric veins were divided using a harmonic scalpel. Subsequently, the spleen and the terminal part of the pancreas were mobilized. Laparoscopic ultrasonography of the pancreas was performed and the site of resection determined. The pancreas was divided using staples. The specimen was removed after placing it in a large basket and retrieved by enlarging the umbilical incision. A drain was left in the pancreatic bed. Patient was discharged on the fifth day after surgery. Postoperative glucagons levels returned to normal.